(Des Moines, IA) -- Iowa Governor Tom Vilsack today took the first formal step toward running for President of the United States by filing documents with the Federal Election Commission to establish his presidential campaign committee, Tom Vilsack for President. Tom Vilsack for President, will be headquarted in Des Moines, IA and will be publicly launched with a multi-state campaign kick-off tour scheduled to begin in Mt. Pleasant, Iowa on November 30 and include announcement events in New Hampshire, Pennsylvania, Nevada and South Carolina. Tom Vilsack is the longest serving Democratic governor in the United States. As Chair of the Democratic Leadership Council and former Chair of the Democratic Governors Association, he is a recognized national leader on education, healthcare, economic development and renewable energy. Tom Vilsack was the first Democratic governor elected in Iowa since 1968. In 1998, he promised to serve only two terms - a pledge that he kept in 2006 despite healthy job approval ratings in his home state. "Americans sent a clear message on Tuesday. They want leaders who will take this country in a new direction. " said Vilsack, Iowa's two-term Governor. "They want leaders who share their values, understand their needs, and respect their intelligence. That's what I've done as Governor of Iowa, and that's what I intend to do as President." "I couldn't be more honored that my wife, Christie, and our sons, Doug and Jess, are committed to joining my effort to offer the people of America and the Democratic Party my vision for the future of our country as a candidate for President," he said. Over the next several weeks, they and the rest of my team will put together the building blocks needed to run a successful national presidential campaign. I invite all Americans to join with us in working for America's future." Official announcement activities are scheduled to begin in Vilsack's hometown of Mt. Pleasant, IA on November 30 and will be followed by events in New Hampshire, Pittsburgh, PA, Nevada and South Carolina. A "Gala Celebration of American Community" is schedule in Des Moines on December 2 as the inaugural fundraising event for the campaign. Members of his campaign staff will move into the new Vilsack '08 headquarters today. The office is located at 6200 Thornton Avenue, Suite 195, Des Moines, Iowa. 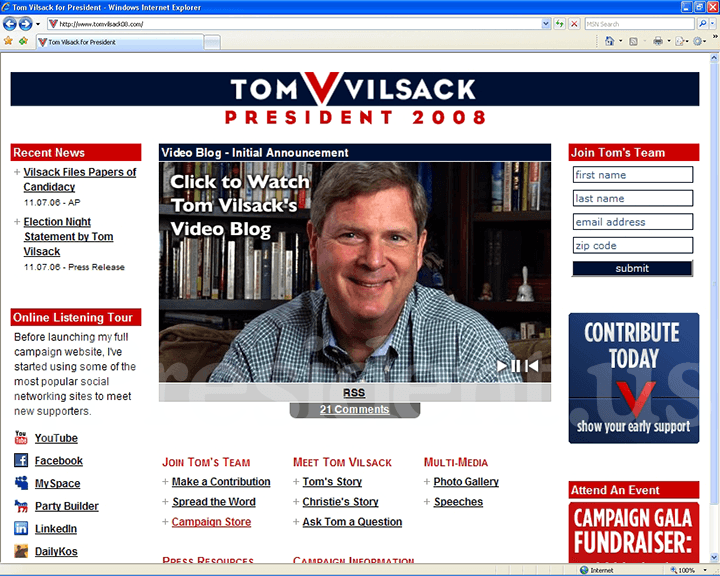 More information about the campaign and how to become involved is available on the campaign's new website: http://www.tomvilsack08.com.